Former Inspector Heather Innes joined Tasmania Police in 1961 at 21 years of age, but had to wait until she was 25 before she could become a Constable. Even then, she didn’t have a badge number. After 12 months, she became a Special Constable – but only got 75% of the Special Constables’ wage, just because she was a woman. 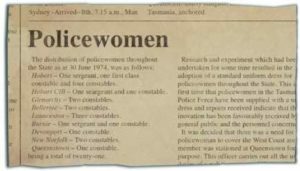 Pay parity was one of the major changes in the 1970s that encouraged more women to join Tasmania Police. Reflecting community changes and societal attitudes towards women, the organisational culture gradually began to change. The year 1979 brought equal pay, followed by practical changes to the uniform for police women. 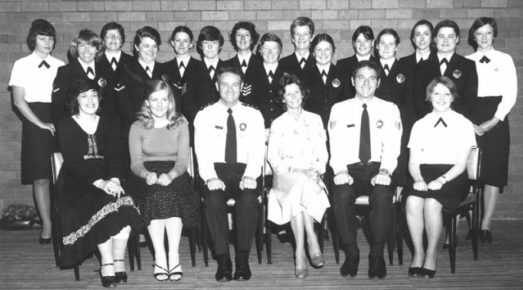 Between 1970–80, a total of 64 women joined Tasmania Police. Still it would be another 14 years before another major barrier for women – the ability to work part-time – was introduced in 1993. Between 1993–2004, 224 women joined Tasmania Police. This included seven women who had previously resigned and then rejoined. Since 1917, there have been 679 appointments up to and including the graduation on 15 September 2017. Today there are 394 policewomen comprising 31% of police officers in Tasmania. The figure has hovered around 30% for several years. Top: 1974–75 Annual Report refers to revaluation of women’s place in policing (recreated excerpt). This page -- https://www.police.tas.gov.au/about-us/100-years-women-policing-tasmania-police/agents-of-change/equal-pay-encourages-women-join/ -- was last published on February 13, 2018 by the Department of Police, Fire and Emergency Management.